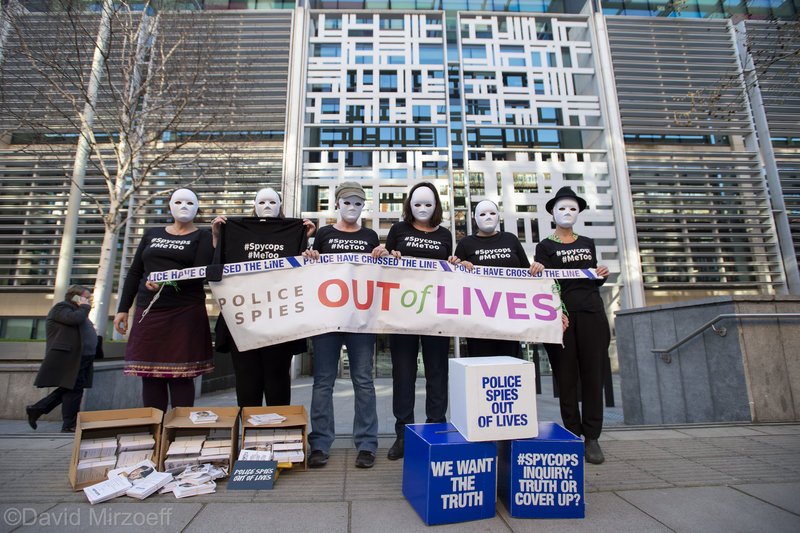 Wearing masks to protect their anonymity and #Spycops #MeToo t-shirts, women deceived into long-term intimate relationships by undercover police officers visited the Home Office yesterday. They handed over 6,000 postcards signed by the public supporting their campaign and a letter the Home Secretary (published below), calling on him to appointment a panel of advisors to support Sir John Mitting who they consider wholly unsuitable to chair the public inquiry into undercover policing. In the most recent Inquiry hearing (31.1.19) Sir John Mitting referred to himself as a ‘pedantic English lawyer’. The investigation into undercover policing is far too complex to be overseen by a pedant. Sadly, it has again been necessary to complain about insensitive remarks made by Sir John at the most recent public hearing, please see our letter to the Inquiry dated March 20th.It is noteworthy that while over three years has been spent by the UCPI allowing the police extensive latitude in making anonymity applications, and granting a significant number of these on the basis of not wishing to interfere with the officers’ right to privacy, in contrast Sir John Mitting displays little or no concern for the privacy and wellbeing of the victims of police spying. In our case we requested disclosure from the police about our relationships in 2011, but we have not received any documents to date either from the police or the Inquiry. We want to ensure that there is an end to these double standards regarding Article 8 rights. On January 29th2019, the Inquiry announced there would be a further delay of one year before evidential hearings are to begin. This is likely to mean that provision of the final report is pushed back a year from 2023 to 2024, having originally been set at 2018. This delay alienates already frustrated core participants further, particularly when in meetings with Sir John Mitting, one of the key reasons given for not appointing additional panel members was the delay involved. We were told it takes approximately nine months to pass the required vetting procedures. *Names in inverted commas are pseudonyms by which we are known to the Public Inquiry.